· You have always asked yourself how you could publish your software as easy as -for example- Microsoft's "PowerToys" - with full install and uninstall support, but using only a few KB's for the installation stuff .... optimal for distributing over the Internet ? · You have finished your project, but don't want to spend additional hours..days.. writing and/or designing the installation routines for your program ? · You want to publish your software via the Internet, and want to make the installation part of your program as tiny as possible? · You don't have the money to buy expensive installation software, that would likely cost additional bucks for each upgrade? · You are looking for a tool that makes creating an installation a task last less than 10 minutes? · You simply hate oversized installation software? · You just have to provide a few files and don't like to add an overhead of 100's of KB's for installation software? · Or you have a lot of files to install but don't like to use huge installation tools for other reasons. · You want to use fast and easy installation routines? · Your project will run under Windows95, Windows 98 or Windows NT 4? · You need "single EXE" setups? Or ZIPped distribution packages? Or you would like CAB (Cabinet) packages for even stronger compression? Or regular disks? Or split (multi-volume) packages which you could then separate onto several disks? · You want to avoid common disadvantages of INF installations like: complicated declaration, unsupported Long File Names, unusual installation ("you have to click the right mouse button..."), documentation leaks, etc? · You need a setup program which supports more languages than just english ? 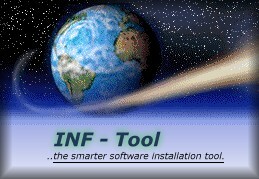 If you answered "YES" to even one of the questions above, then INF-Tool is the Tool for you! It was designed for making installations a snap! Choose from 1 of 6 distribution options. All of them are based on Windows' built-in Setup techniques, which saves a lot of overhead for your distribution package. Huge and expensive installation software should now be obsolete! Please read the feature list on the next page to find more about the details.